Mr Mackay said the move to a five-band income tax system will mean no one earning less than £33,000 in Scotland will pay more tax than they do now. Scots budget: what does it mean for me? Report: How was the budget unveiled? And he told the Scottish Parliament that those earning above that figure would only pay a "proportionate amount more" than they currently do. His figures showed that 55% of Scottish taxpayers will pay less compared to south of the border under the new system - with 45% of people paying more. Someone in Scotland earning £150,000 will pay £1,774 more than if they lived elsewhere in the UK, with someone earning £40,000 paying £140 more. Accountancy body ICAS calculated that, of the 2.2 million basic rate taxpayers in Scotland, 1.4 million will be marginally better off than those in the rest of the UK whereas the remaining 800,000 will have a slightly increased tax bill. All 346,000 higher and 20,000 additional rate taxpayers will pay more. Mr Mackay also outlined how lifting the public-sector pay cap would allow for a 3% pay rise for public sector workers earning less than £30,000, and a 2% rise for those earning more than that - with a cap of £1,600 for those earning £80,000 or more. And he pledged a further £600m to provide superfast broadband to all premises in Scotland by 2021. The Scottish government was given powers over income tax rates and bands last year, with the new rates being paid by anyone who lives in Scotland. Mr Mackay had faced warnings from business leaders and the Scottish Conservatives ahead of his budget statement that Scotland could not afford to be associated with higher taxation than the rest of the UK. The finance secretary insisted the changes - which he said would raise an additional £164m - were necessary to "mitigate UK budget cuts, protect our NHS and other public services, support our economy and tackle inequality in our society." He said the tax reforms would make "Scotland's income tax system even fairer and more progressive". And he said a bigger increase in the top rate of tax for those earning more than £150,000 - which some opposition parties had called for - would actually reduce revenue as high earners would find ways to avoid paying it. What else did Mr Mackay announce? Local government resource budget will be protected in cash terms with the capital budget increased in real terms "resulting in a total increase in local authority core funding of £94m"
Private schools will no longer be eligible for charitable relief from business rates, but universities and council arm's length bodies will be. Income tax. Public spending. Employment. Pay. The NHS. Schools. Indisputably, serious stuff. But there was more than a touch of mischief about Derek Mackay's demeanour as he got to the tax bits of his budget. Normally, he exudes gravitas, solemnity even. But he could not help playing to the gallery with a declaratory grin when he insisted that, for most people, Scotland would now be the lowest taxed part of the UK. Said gallery - led enthusiastically by Mr Mackay's predecessor, John Swinney - applauded loudly. The reason for this glee? Politically, the claim is a direct and precise retort to Conservative attacks that Scotland is taxed more highly. But, of course, when the dust dies down, the Tories will return to that attack. 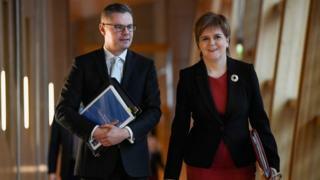 Mr Mackay's budget statement was accompanied by the first economic estimates from the new Scottish Fiscal Commission, which said the country is facing "subdued" growth over the next five years. The independent body predicted the Scottish economy will grow at less than 1% per year until 2022 - lower than that predicted by other economists. Its five-year forecast suggests GDP growth will be 0.7% in both 2017 and 2018, rising to 1.1% in 2022. It said the outlook was "driven by slow productivity growth and exacerbated by demographic challenges". What has the reaction to the budget been? Scottish Conservative finance spokesman Murdo Fraser branded the creation of a new basic rate the "Nat tax". He accused the SNP of breaking a 2016 manifesto promise pledging not to increase the basic rate of income tax for those on low or middle incomes, and claimed the real reason was that Scottish economic growth is lagging behind the UK. Scottish Labour leader Richard Leonard said the Scottish government's tax and spending plans had "tinkered round the edges" instead of implementing radical change and delivering a genuine alternative to "Tory austerity". Scottish Greens co-convener Patrick Harvie said he was "delighted that the argument for a more progressive tax structure appears to have won the day", but said Mr Mackay should have gone further. And Scottish Liberal Democrat leader Willie Rennie said the budget was a "missed opportunity" and "does not do enough to meet the long term needs in the economy". Elsewhere, the Federation of Small Businesses said a majority of its members were against income tax rises, and that the Scottish government was steering the country into "uncharted economic waters". The Scottish Chambers of Commerce welcomed much of the budget as being positive for business, but repeated its concerns about "Scotland's new status as the highest-taxed part of the UK." And local government body Cosla said councils would continue to face "really difficult times" in the future, despite the "more measured approach" by the Scottish government.